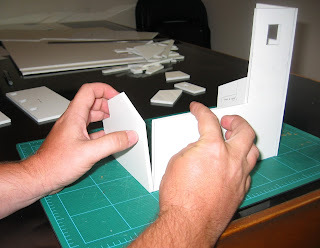 Clarence Harrison - The pieces may all be assembled with ordinary white glue. After the basic construction is complete, you can turn to the details that will establish the character of the building. The frame as it stands before detailing could be adapted to any period or theater. Is it made of wood or stone? Is the roof thatched, shingled, or tiled? Since you will likely already know these things before starting (you made a plan, remember? ), they should be easy to answer. The abbey is made of stone and has a traditional Spanish tile roof. Looking at my reference photo I picked out a few more details like the narrow ledge under the windows on the tower and the ornamentation around the door. The former is easily made from narrow strips of balsa wood while the later comes from an old plastic kit I happened to have on hand. While I was at it, I found a set of windows that gave the tower a more dignified look as well. 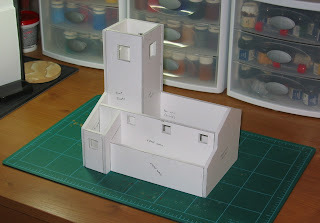 In this case, both components came from Games Workshop kits, but you can find similar items from model train kits. To achieve the effect of stonework, I cut out a jillion (give or take) rectangles out of card and glued these to the corners of the building. Not only does this effectively convey the look I want, it hides the joins between the foamcore walls that might spoil the illusion I'm trying to create. 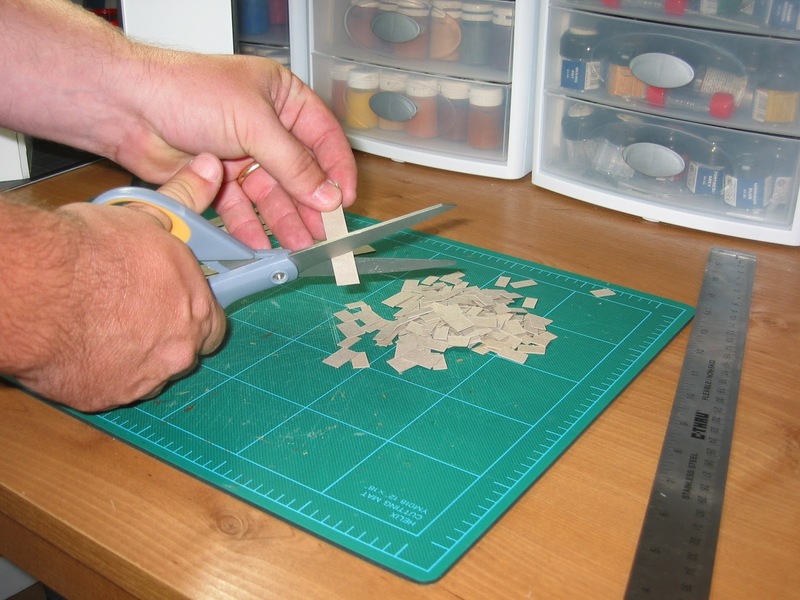 I use simple white glue to join the walls together. Note the green cutting mat below - it has a grid that I use to ensure the structure is as square as possible. It doesn’t look like much yet, but the basic frame of the abbey is finished. I cut out about a jillion small rectangles from common thin card. This came as backing from a pack of computer paper, but cereal container card works just as well. With the addition of some commercially available doors and windows (these came from old Games Workshop kits) and my hi-tech cardboard stones, the abbey begins to take shape. 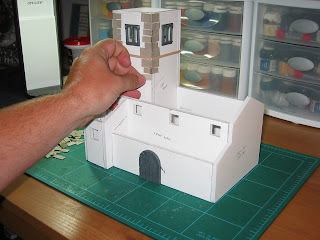 We'll talk about the roof in a bit, but next week I'm going to show you how to make the hill from which the abbey will overlook the battlefield.